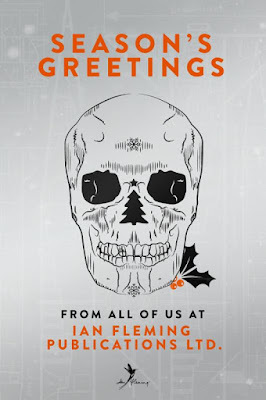 James Bond - The Secret Agent: A Christmas card from Ian Fleming Publications no less! A Christmas card from Ian Fleming Publications no less! It's been yet another eventful year for us, with our publishers around the world making the most of the surge in excitement for James Bond properties, prompted by the release of Eon Productions' 24th Bond film, SPECTRE. Our biggest event was the publication of Trigger Mortis by Anthony Horowitz on 8th September. This book is particularly special, because Horowitz used a previously unseen outline for a television script penned by Ian Fleming as the springboard for his story. The book has been extremely well received both here and in the States and featured in both the UK chart and the New York Times Bestsellers' list. The book has been published by friends new and old around the world, and everyone has had a lot of fun with the motor-racing and rocket theme. In the UK, for example, Orion designed a cover which could be turned into a model rocket. They also produced a special, limited edition for Waterstones which included the original TV outline, Murder on Wheels, and worked closely with Random House to ensure that the original Fleming novels, Goldfinger in particular, benefited from the attention Trigger Mortis received. Orion recorded and published an audio version read by David Oyelowo, acclaimed star of the award winning film Selma, with US and Canadian release in the careful hands of American publishers, HarperCollins. We thank all our publishers for their enthusiasm and ingenuity. Our first ever continuation Bond novel, Colonel Sun by Kingsley Amis, received unexpected attention this year, when Eon Productions asked to use a section from it within the script of SPECTRE. Although it had been available in ebook form, it had not been in physical print for more than a decade. With extremely short notice, Random House published a lovely paperback edition in time for the film's release. Our international publishers of Colonel Sun have made the most of the opportunity, and an audio edition will be re-released by W F Howes shortly. Last year, we announced a new partnership with Dynamite Entertainment for James Bond comic books and graphic novels. Production of their first Bond series entitled Vargr, set in the modern day, commenced early this year. The series is being written by the highly respected Warren Ellis, and each issue is strikingly visualised through visceral artwork by Jason Masters. Dynamite are also developing a series of adaptations of the original Fleming novels and one exploring the origins of Bond, along with projects involving other characters from the Bond canon, next year. Film years are always good news for the Fleming Bond novels, and this year was no exception. Even though it is not based on a Fleming novel, there was increased interest in the origins of the criminal organisation, SPECTRE. Random House and Amazon have both produced omnibus volumes of the Fleming titles which feature SPECTRE under the title The SPECTRE Trilogy. Our audio partners are doing the same, and Titan, who publish the Express comic strips, have produced a SPECTRE anthology of the original Horak and McClusky comic adaptations, newly enhanced for incredible sharpness and detail. Also to coincide with the film release, The Folio Society have produced a beautifully illustrated edition of Casino Royale and will be giving the same loving treatment to From Russia With Love next year. Fay Dalton is the chosen artist, wonderfully evoking the period setting and luxurious, but equally glowering and dangerous, atmosphere of Bond's first outing. The new Young Bond series continued with the paperback release of Shoot to Kill in November, and the upcoming Heads You Die is due for publication in May 2016. Additionally, there are two further novels by Steve Cole in the pipeline which will see Bond progressing through the 1930's amidst the building tension of pre-War Europe. Over the airwaves, Radio Four released their fourth Fleming radio play this summer, performing Diamonds Are Forever, with Toby Stephens reprising his role as James Bond. We would like to congratulate Fergus Fleming and The Ian Fleming Estate on the publication of The Man with the Golden Typewriter; a collection of Ian Fleming's letters edited by Fergus. It is a fascinating read, particularly for those of us in the publishing industry, and they should be very proud of it. I've just skimmed the surface of all we've done this year, as there's been a lot of activity on our older continuation authors as well. Works by John Gardner, Raymond Benson, Sebastian Faulks, Jeffery Deaver and William Boyd continue to garner new translation deals overseas, but we don't have the time to list them all here. Looking forward, we are exploring licensing around our literary assets; having taken tentative steps into this area in the past, we are now taking a more serious approach and have enlisted the help of Jo Edwards and her team at Random House Enterprises. And finally, there have also been new developments in the IFPL team. Tilly has been with us as Finance Manager for just over a year, and Jonny Davidson has joined us as our Administrative Assistant after Phoebe left us in the Spring. I am delighted to welcome them both. The advent of a younger team has meant that we are now very active in social media, and I would like to encourage you to keep track of our activities throughout the year on our website, but also on Facebook, Twitter, and now Instagram.